Penny Anderson Associates Ltd. (PAA) has an extensive track record in the preparation of literature searches and reviews and many of these studies have been published. Most of our projects involve some element of literature or web-based review – even standard ecological surveys for development involve research into local conservation priorities, Biodiversity Action Plans and reviews of web-based biological records. However, a full literature and data review is a more in-depth exercise. Worral, P. and Little, S.F. 2011. Urban ecology and sustainable urban drainage. 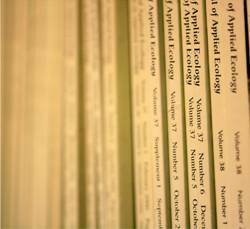 In: The Routledge Handbook of Urban Ecology. Douglas, I., Goode, D., Houk, M.C. and Wang, R (Eds). Vernon, E. and Hamilton, H., 2011. Methods of Control and Eradication of Canadian Pondweed and Nuttall’s Pondweed in Standing Waters. SNH Commissioned Report. SNH, Perth. Worrall, P., Keen, A. and Hammond, G., 2008. Restoring the Upper Catchment Functions of Rivers: The SCaMP Experience. RRC 9th Annual Network Conference. University of Exeter. April 2008. Worrall, P., 2008. Sustainable Catchment Management Programme (Scamp) – Landscape Change and Flood Management. Journal of Practical Ecology and Conservation, 7, 1. A Review of Approaches for Monitoring the Success of Peatland Restoration. (SWIMMER and Natural England). Input to a chapter on best practice guidance for gully and grip blocking as part of a (as yet unpublished) handbook on upland management (Moors for the Future and Natural England). Natural England Commissioned Report NECR012. Countryside and Rights of Way Act, 2000 Part I: Access to the Countryside. Natural England, 2009. A. McBride, I. Diack, N. Droy, B. Hamill, P. Jones, J. Schutten, A. Skinner, and M. Street (eds), 2010. The Fen Management Handbook. Scottish Natural Heritage, Perth. Hawley, G., Anderson, P., Gash, M., Smith, P., Higham, N., Alonso, I., Ede, J. and Holloway, J., 2008. Impact of heathland restoration and re-creation techniques on soil characteristics and the historical environment. Natural England Research Report NERR010. Review of literature on restoration and management techniques as part of a study monitoring biological water quality in upland streams around Malham Tarn to assess the effects of diffuse agricultural pollution on aquatic invertebrate communities (National Trust). Naden and Greenbooth Management Plan – Justification of Works. Literature review into blanket bog drainage and grip blocking techniques (United Utilities Plc). Peatscapes Project – bibliography development and review: a review of grip blocking techniques and the measurement of water levels and soil moisture in blanket peat (North Pennine AONB Partnership). Review of Techniques for the restoration of purple moor-grass moorland – literature review as part of wider recommendations for the restoration of Molinia-dominated moorland (Countryside Council for Wales). Taylor, K., Anderson, P., Taylor, R., Longden, K. and Fisher, P., 2005. Dogs, access and nature conservation. English Nature, ENRR No. 649. Anderson, P., Lunt, P., Fisher, P., Longden, K., Taylor, K. and Taylor, R., 2005. A Review of the Effects of Recreation and Sport on Nature Conservation. English Nature. Research of literature into nutrient status of flood-meadows as part of pre-translocation decision-making on key parameters, nutrient functioning and site selection. Used to find appropriate receptor site as part of Heathrow Terminal 5 pre-construction works (BAA). Hawley, G., Ross, S., Shaw, S., Taylor, K., Wheeler, B. and Worrall, P., 2004. Research Report No 610. Nutrient enrichment of basin fens: options for remediation. English Nature. Penny Anderson, 2003. Habitat translocation – a best practice guide. CIRIA, London, UK.